Gardening is one of my passions. 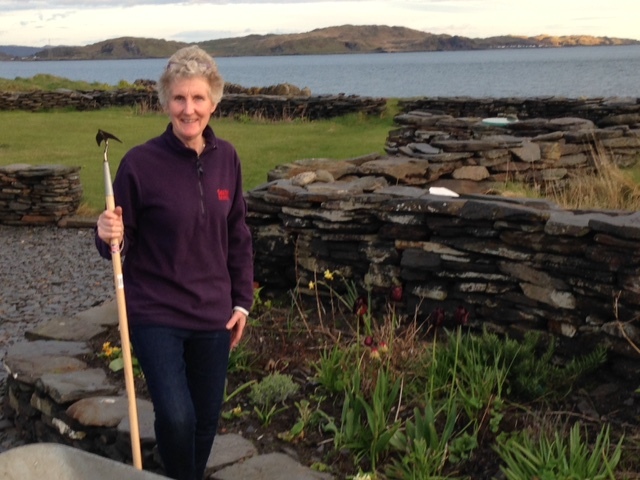 Leaving my Perthshire garden of 25 years with its rich soil was a wrench. It supplied our growing family with fresh fruit and vegetables for much of the year. How was I going to restart again on an island battered by wind and sea spray and virtually devoid of soil? 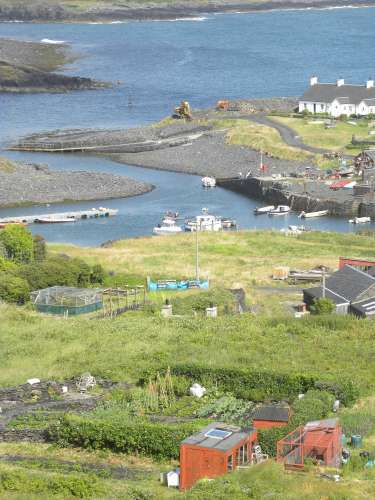 I was told that during the quarrying days that Irish Puffers arriving at Easdale to collect slates carried peat or soil as ballast to temper the motion of the unladen vessel. The peat being removed from the Puffer into the tramway trucks prior to loading. The peat was then deposited in various locations around the island adjacent to the tramway system. Where to site my new allotment? Armed with my shovel and knowing the basic route of the old tramway tracks I carried out a series of test digs before deciding. 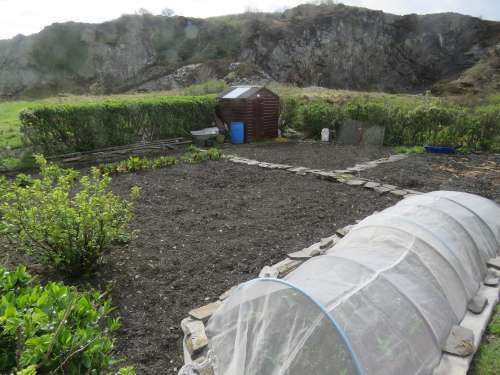 There were, and remain, very few people working a vegetable garden or allotment on Easdale yet during the quarrying days most families worked the land, and the walled areas can be clearly seen. 17 years ago, I naively thought the three foot high slate wall on the northern aspect of my chosen area would be sufficient protection for my vegetable plants. I grossly underestimated the strength of the wind particularly when you least expect it, mid July. Before the wind my carefully nurtured runner beans were in full flower. After the wind the soil was red, covered with the flowers had been stripped off during the night. The canes were at a jaunty angel too. A hedge was the only answer. I was kindly offered cuttings from an established escolonia hedge in Ellenabeich. The cuttings rooted obligingly, along with some New Zealand holly, and were planted in the autumn around three sides of the plot. I also laid carpet on an area of grass alongside one side of the fledgling cuttings, to create an onion bed. The field mice moved in under the carpet over the winter and grazed on the new hedge cuttings just beside their abode. Potential hedge on one side was devastated but regrew. The storm of January 2005 literally blew my quietly establishing hedge away. Only a few sticks and stalks remained. I was very despondent. Over time the hedge has re- established itself. The condition of the soil continues to improve with copious amounts of seaweed and rock dust. Organic animal manure is in short supply so I compost everything and encourage our crew to do likewise. Jess' allotment in fine fettle in 2005. I tend to grow the vegetables we like but it is always a bit of a lottery as to what does well. It definitely differs from year to year for whatever reason but my guess is wind, rain and temperature. One year I bought a book and tried to plant everything according to the correct phase of the moon. It made little difference. ‘Over wintering’ anything is hit and miss, the elements, particularly wind, can have a devastating effect. Leeks are often “ helicoptered” to stumps. Purple sprouting broccoli and sprouts flattened to horizontal despite being carefully staked. Whatever we do get to eat tastes so much better than anything you can buy in the shops. It is worth the effort, and I feel I am doing my bit in a small way, to reduce my carbon foot-print on this planet. Spring 2017 - after a cold winter, ready for the off ! You would be hard pressed to have an allotment with a more stunning view. There is a tendency to lean on the spade a fair bit and contemplate the day. I have become quite philosophical about gardening on Easdale Island and over time the phrase ‘there is always next year’ is at the forefront of my thoughts. 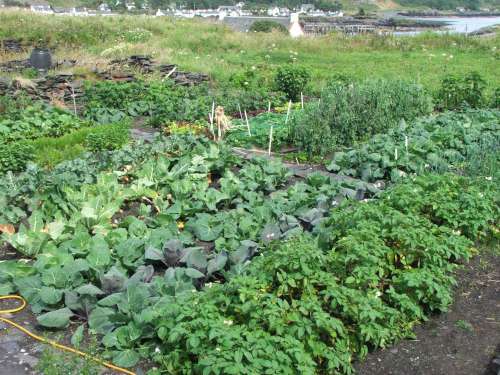 An allotment with a view ! Posted in Blog on April 26, 2017 by carolyn.